One feature of Science in the Parks that’s unique is how we have to make things in large volume and in a manner that’s as interactive as possible. So, we have entire tables covered with lenses and sounds that get propagated in long drain pipes; we build towers that are taller than everyone in the park except one person and we have tables covered with goo. One of our favorite and most enduring activities is making giant bubbles from giant buckets of bubble juice. We have a lot of recipes for a variety of goo and slime and simple bubbles, and we also have this tried and true recipe for giant bubbles. This recipe has some strange ingredients, such as surgical lubricant and J-Lube powder, a lubricant for delivering calves. (I told you it was strange!) There’s a little more information on the recipe page, but Alexis, Drew, and Liz have gone to the trouble of demonstrating the process so that you can see it firsthand. The part of this that I like the most is how it’s completely accessible and fun. There are no lab coats, no complicated facilities, and nothing that’s beyond the scope of a preschooler–as long as their arms are long enough to open and close the bubble-maker. And no matter how many times we make bubbles, it’s always wondrous. Bubbles (even the small ones) defy common sense. They’re films of water (mostly) that stick to themselves to make a complete, enclosed surface. You can blow bubbles with wands, string, hoops, your own hands, and so much more. And, once you’ve created your own base recipe, you might start to try other variations: more or less water, additions of glycerine, other sticky stuff (corn syrup, guar gum), different conditions, etc. 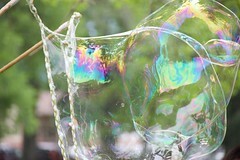 For even more ideas and inspiration, you might take a look at this soap bubble wiki. This is what science feels like. A lot of building (and eroding, toppling, and flipping) happening today by lots of scientists, big and small.